TOTAL FLANKER...a rugby blog: Rugby? Gone soft? Don't be daft. While I do have some sympathy with Leicester's Will Spencer's red card for a high tackle against Wasps on Sunday, the decision was ultimately the correct one. There was no malice or intent in Spencer's tackle on Tommy Taylor - but it was a forceful shoulder-to-head tackle and the law is clear that such a challenge constitutes a red card offence. To those whose knee-jerk reaction is that the game has "gone soft" - please - don't be daft. Just take one look at the number of walking wounded at Premiership clubs after just 3 weeks of action. 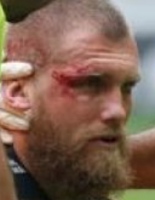 Go on, ask Cornell du Preez (fractured larynx), Brad Shields (fractured cheekbone) or Olly Woodburn (broken jaw) whether the game has gone soft. Or ask former Leinster and Leicester flanker Dominic Ryan - forced to retire this month aged 28 after repeated concussions. It is right and proper that World Rugby is attempting to address the increasing issue of head injuries by making players tackle lower - and if there are a few perceived injustices on the road to Damascus then so be it.